Tom Waits | News | Tom Waits &#8220;Glitter &#038; Doom&#8221; Out Today! Tom Waits “Glitter & Doom” Out Today! Tom Waits much anticipated two disc live album “Glitter & Doom” is officially out today! 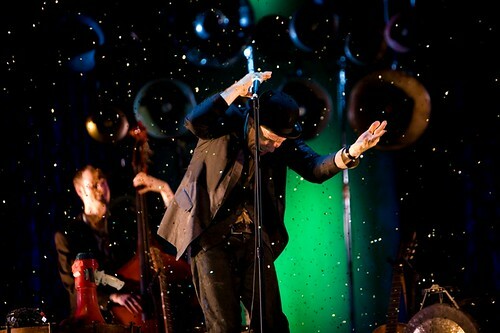 The record offers a riveting musical document of Waits’ sold out, highly acclaimed Glitter and Doom tour of the US and Europe in the summer of 2008. Disc One is designed to sound like an evening’s performance, even though the 17 tracks are selected from 10 cities, from Paris to Birmingham; Tulsa to Milan; and Atlanta to Dublin. Disc Two is a bonus compendium called TOM TALES, which is a selection of the comic bromides, strange musings, and unusual facts that Tom traditionally shares with his audience during the piano set. Purchase at Amazon by clicking here.